Mt. 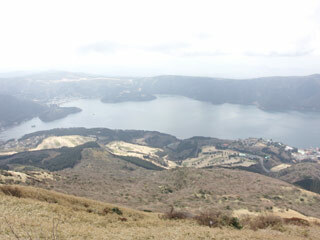 Komagatake (箱根駒ケ岳, hakone komagatake) is the tallest mountain at Mt. Hakone in Kanagawa prefecture. It has 1327m high and you can reach to the top by ropeway. At the top of Mt. Komagatake, you can enjoy great view of Mt. Fuji and Lake Ashino. You can also view the Sagami Bay and Izu Peninsula. There are many hiking courses to reach the top. There is Hakone Motomiya Shrine at the peak of the mountain. Round trip: 1050 yen for adult, 530 yen for kid. One way: 620 yen for adult, 320 for kid. There is group discount for the tickets. Mt. Komagatake is one of the best view spots for Mt. Fuji. The panorama view at Mt. Komagatake contains Mt. Fuji, Lake Ashino, Izu Peninsula, and Sagami bay. However, Mt. Komagatake is almost always clody, so it is very hard to get clear view of Mt. Fuji. The ropeway is also very interesting. The speed of the ropeway is 18 km/hr. It is very fast. Also, there are many hiking courses. So, you can enjoy hiking, too.